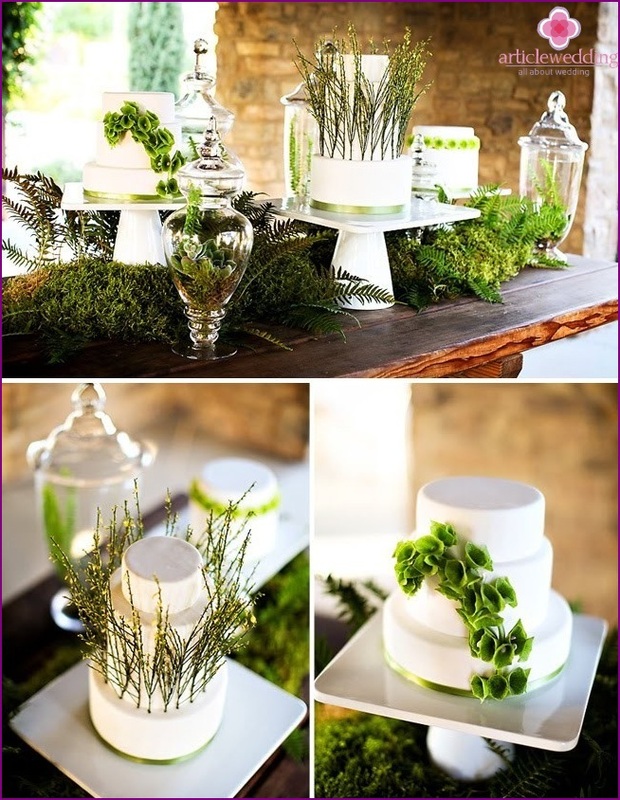 Wedding celebrations in style eco-chic, or,different, green wedding, have already gained popularity around the world. If you are an environmentalist, or simply want to make your wedding the most original, but it is inexpensive, then this option is for you! 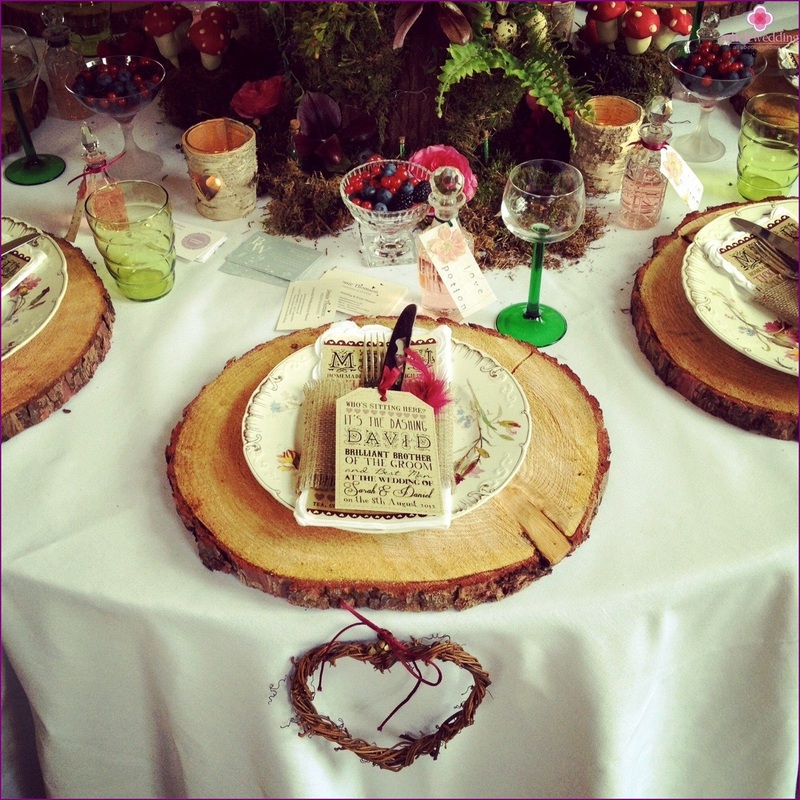 What is a wedding style eco-chic? 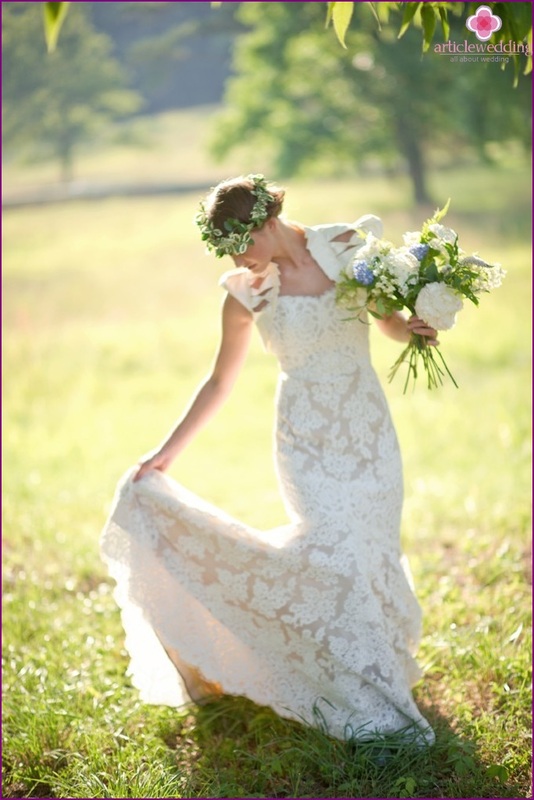 Young people are more likely to adhere to the respect for nature, so the wedding style eco-chic is now in vogue. The scenario of the wedding It implies rejection of the destructive influencecivilization to the living world. The basic idea - Easy throughout and maximum environmental friendliness, which does not exclude, however, individuality and originality. 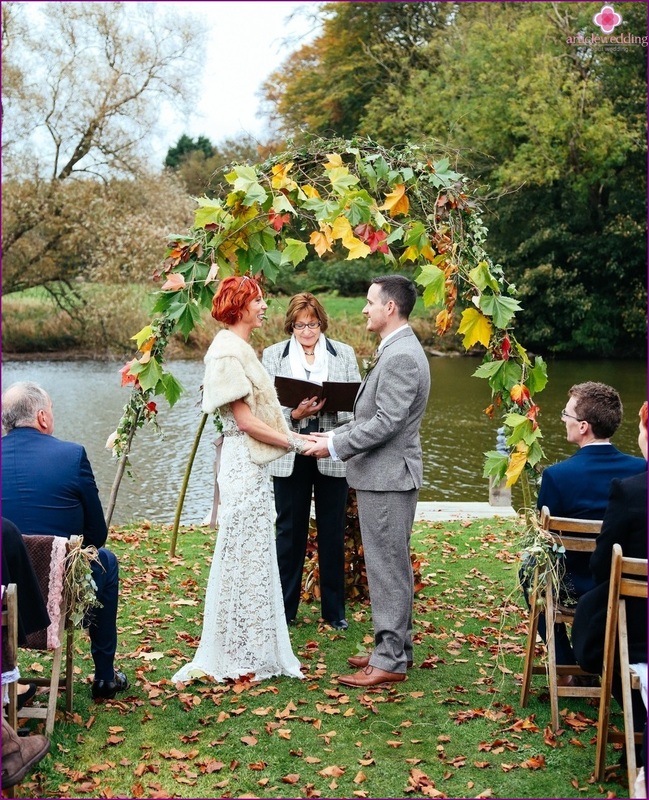 Immediately it may seem that green wedding absolutely not connected with the concept of luxury. But in reality, such a marriage is full of elegance and style. 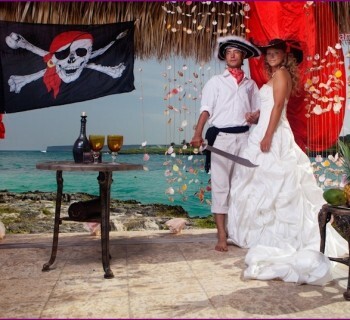 Moreover, there is one distinct advantage that attracts honeymooners: sticking to the script, you can almost halve wedding budget. 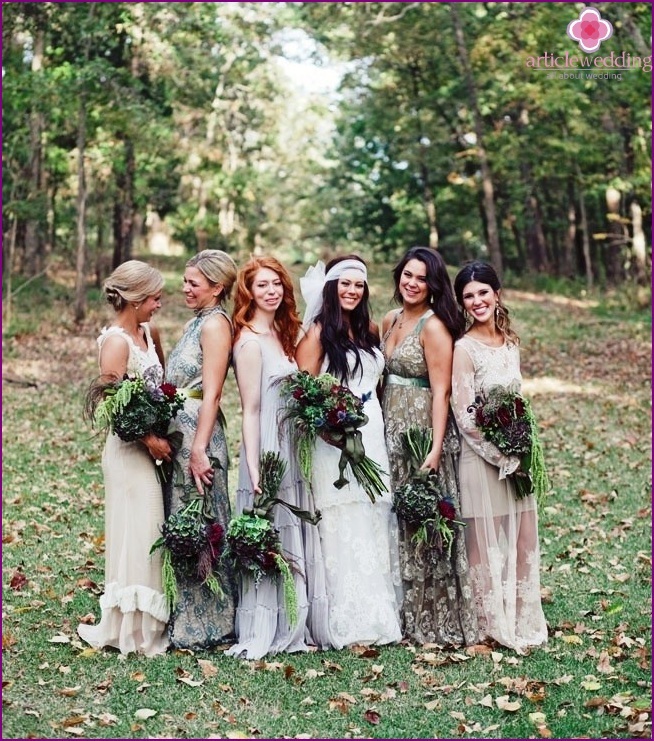 The traditional color palette of eco-chic wedding - it's green, brown and beige tones. For such weddings of relevant accessoriesnatural materials - wood, cardboard, recycled paper, newspaper, glass jars, natural fabrics. 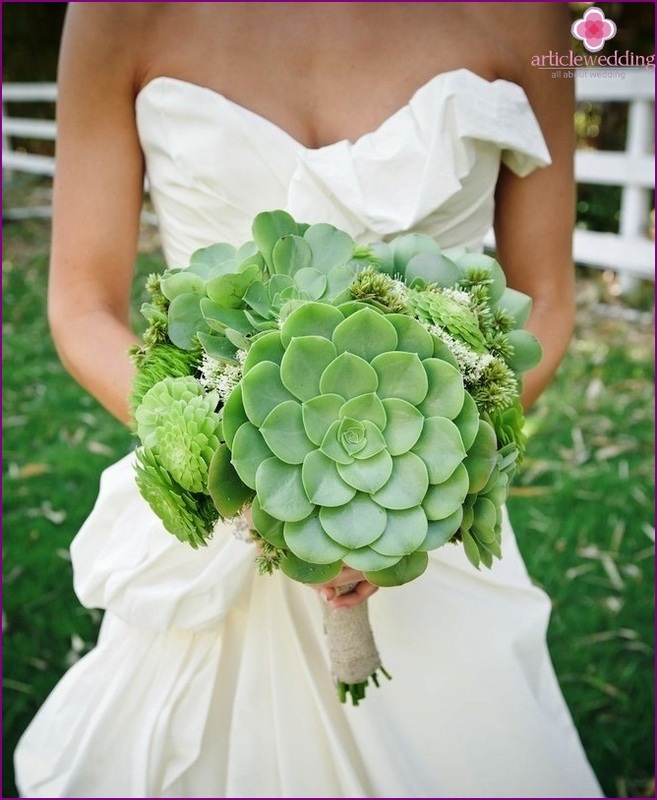 Instead of the usual bouquets use evergreen, wild or grown in their cottage plants and flowers in pots. In such a celebration is definitely no place for plastic, polyethylene and other unnatural products. 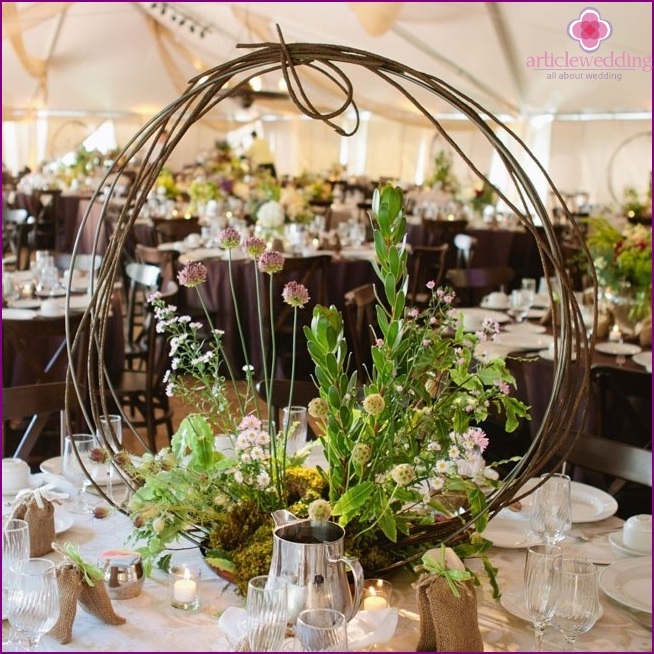 The best interior design for weddingstyle eco-chic is a lawn in the park or in the forest, garden, rustic wooden cottage. 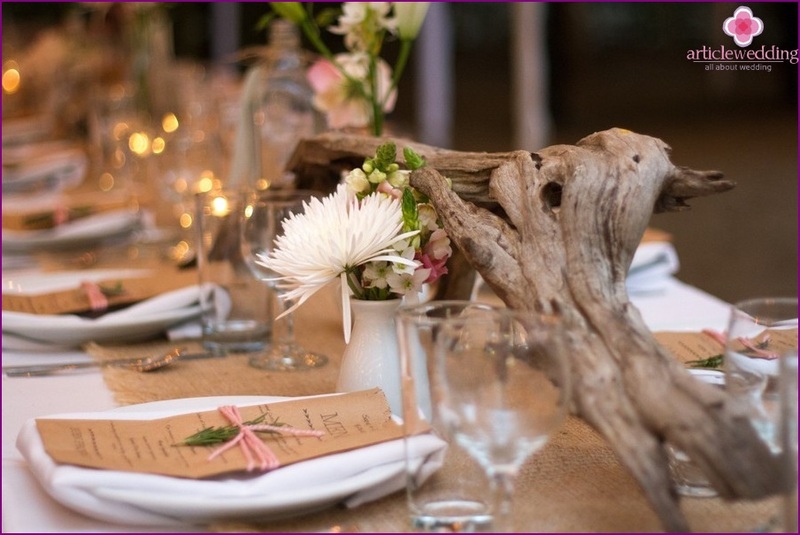 Marriage in nature or in a house made of wood will only accentuate the idea of ​​your wedding and the script will not leave anyone indifferent. The materials and components used fororganizing such a wedding, we need to talk about saving resources. Website www.articlewedding.com advises to choose natural light, to organize a wedding in nature, and thus spend less energy. 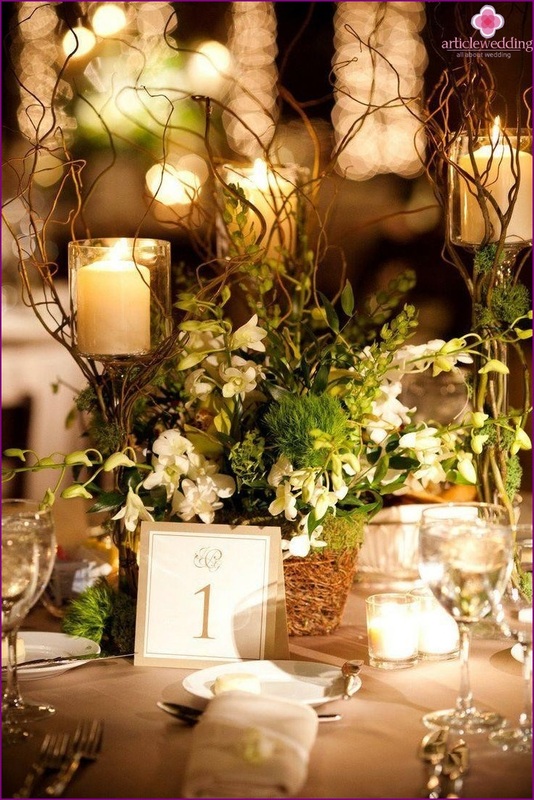 In the evening, you will need additional lighting - use candles that create a wonderfully romantic atmosphere. Book live music rather than services DJ. Finally, select the ecological mode of transport: bicycles, boats, or even a tuple of horses. Believe me, such a wedding will be remembered to you and your guests for a long time! 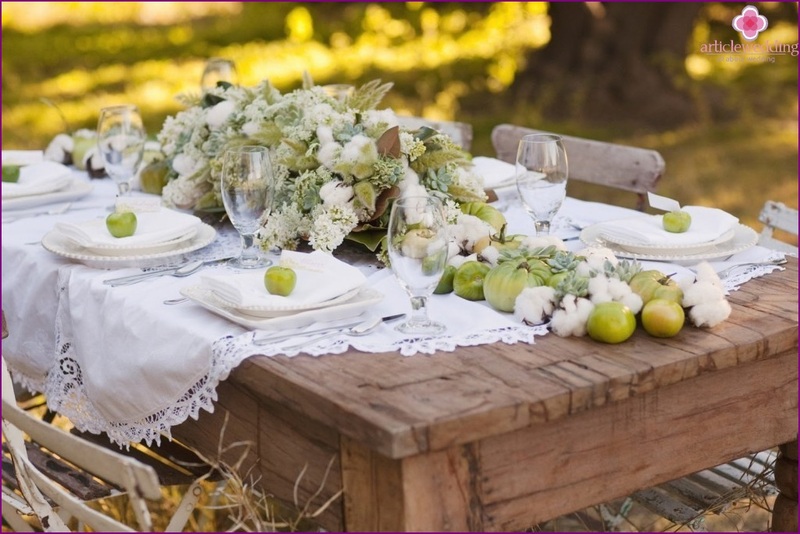 Dishes on the green wedding prepared with only the freshest and natural products. The image of the young couple must match the selected style wedding. For the bride the perfect choice in this case - vintage wedding dress and picked up its accessories. For example, you can take the old mother's or grandmother's jewelry that will add a touch of nostalgia. For make-up is preferable to use natural cosmetics. 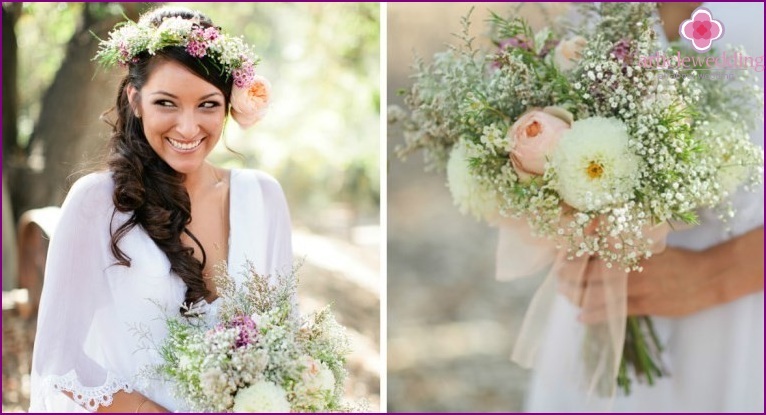 It is also not necessary to make a bright make-up, because the main idea of ​​the wedding - the simplicity and naturalness. For the groom best option wedding dress will suit made of natural materials and without the use of synthetic chemical dyes - silk, linen or organic cotton. One of the most important parts of any wedding isdecor, which must match the selected style celebration. 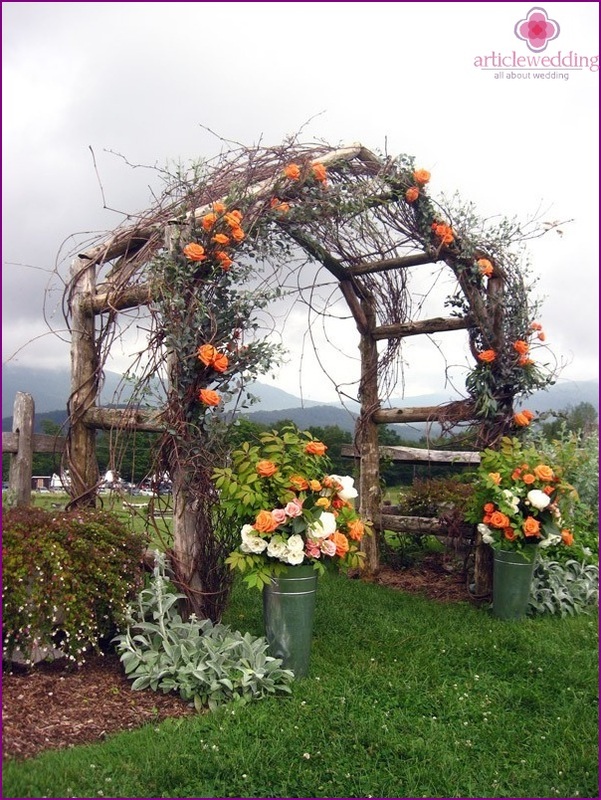 Wedding portal www.articlewedding.com offers some interesting ideas, which only emphasize the originality of the eco-chic wedding. 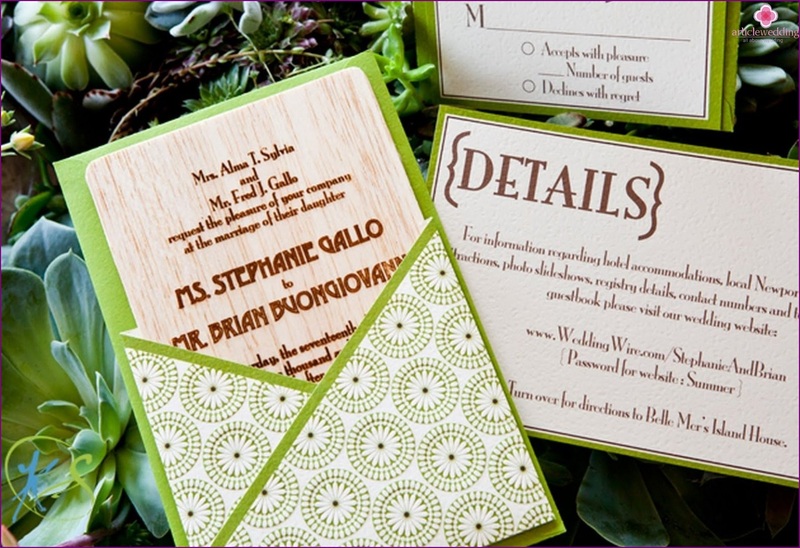 For invitations to take recycled cardboard, paper or material that will not harm the environment, such as bamboo. Use fruit carved with the names of guests and numbers of tables instead of traditional desktop cards. Another option - to put them in little pots with herbs. Instead of vases for flowers, take the used light bulbs or glass bottles. And instead of candlesticks - conventional banks or ... small birch logs. For registration, you can use burlap,string, old newspapers, books, bumps and logs, tin and glass jars, plants - everything in everyday life is very easy to find without too much material costs. 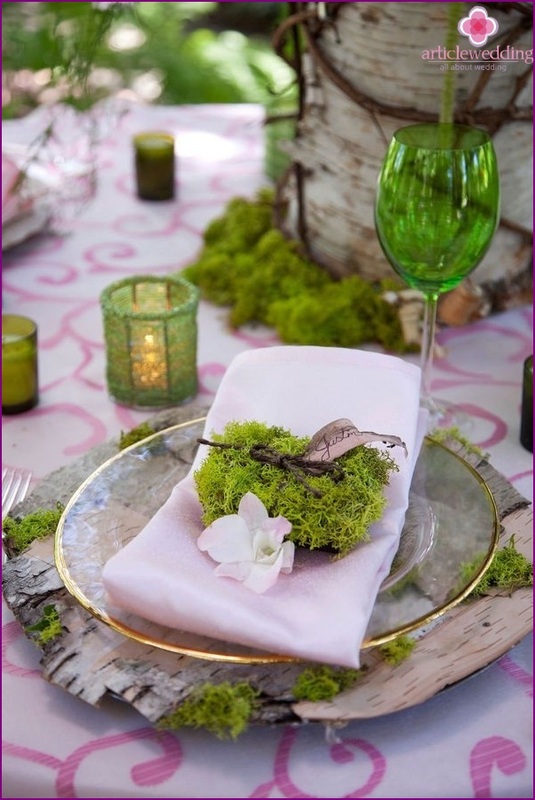 Wedding in eco-chic style requires your imagination andcreativity. But if you try, as a result it will look original and very stylish. An important role is also played a noticeable savings in its conduct. 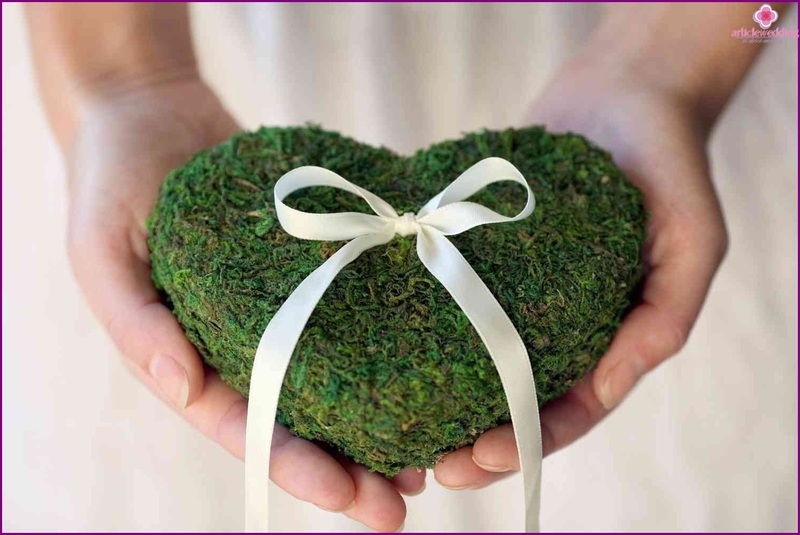 This is why green wedding is becoming more popular in the world. Wedding in the winter? Why not! 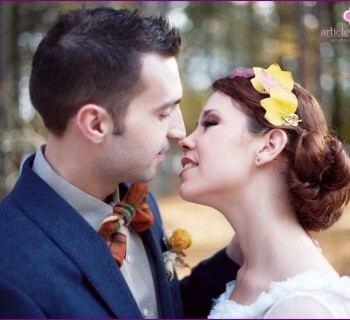 Autumn Wedding - raznotsvete fantastic ideas!